Preparation Time: Preparation can take several hours, so that one ice cream layer can freeze before another is added. 1. To prepare the almond layer beat egg whites until stiff peaks form, gradually beating in the icing sugar, a spoon full at a time. Lightly beat the egg yolks and fold in the whites. Whip the cream with the almond essence until soft peaks form and fold into the egg mixture. Lightly oil a 20cm / 8 inch round cake pan. Pour in the almond layer mixture and smooth over the top. 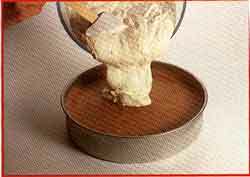 Cover with cling film and freeze until firm. 2. To prepare the chocolate layer, beat the egg whites until stiff but not dry and gradually beat in the icing sugar. Whip the cream until soft and fold into the egg white mixture. Put the chocolate in the top of a double boiler over simmering water. Remove it from the heat and stir in the egg yolks. Combine cocoa and water and add to the chocolate mixture. Allow to cool and then fold into the egg white mixture. Spoon the chocolate layer over the almond layer and return, covered, to the freezer. 3. To make the fruit layer, whip the cream until soft peaks form. Whip the egg white until about the same consistency as cream. Gradually add the icing sugar, beating well after each addition. Combine the two mixtures fold in the fruit and nuts. Spread this mixture on top of the chocolate layer cover and freeze until firm. 4. 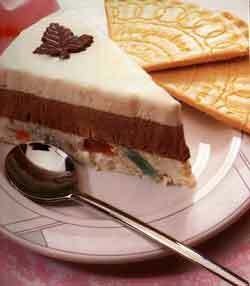 To serve, loosen the cassata from around the edges of the pan with a small knife. Place a hot cloth around the pan for a few seconds to help loosen. Turn out onto a serving plate and cut into wedges to serve. 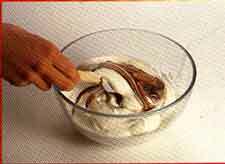 Preparation: Whisk the cream softly; over-whisking will cause it to separate. Whisk the egg whites in between each addition of sugar. If sugar is added too quickly, egg whites will not stiffen sufficiently. Serving Ideas: Sprinkle the top layer of the cassata with more chopped pistachios and chocolate curls. Decorate with rosettes of whipped cream, if desired. Can be served with a fruit or chocolate sauce.